The Ravagers fill the role of the bad guys in Ardent Seas, but are they really bad? They have no consciousness, they just do as they are programmed: Seek and destroy foreign technology. Because of their alien nature, they’re going to differ in some fundamental ways from the Tenorran Defense Navy and the Coalition. Unlike them, they do not depend on Islands what so ever, whereas both the TDN and CPSN have to capture islands to gain access to higher tier units. Furthermore, the Ravagers don’t use fuel or ammunition, their ships get everything they need from the Sea below. That doesn’t apply to their aircraft though, which are just as dependent on energy and ammunition as the other two are dependent on fuel and ammunition. Instead of Fuel, the Ravagers require Bandwidth. To increase the bandwidth, you have to upgrade the Flagship, that can be done a few times, and after that build Auxiliary Command Ships, which in turn can also be upgraded to further increase the bandwidth. 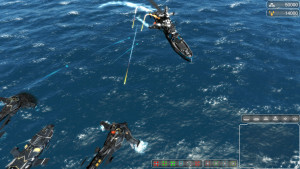 Bandwidth works very much like power in other RTS games, if the limit is exceeded, ships shut down. 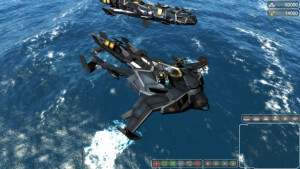 They can however disable ships to bring the usage back down within the current limit. Ravager ships are fast and lethal, and are protected by powerful shields, but their firing range is limited and their have weak armor. The shields and weak armor are both a weakness and strength of this faction. Shields aren’t quite as good as armor, but unlike armor, they will regenerate on their own. Additionally, shields attenuate damage based on how much damage they’re receiving, which makes them very, very good at taking on superior numbers. They also build a bit differently. Their Flagship can produce every unit they have, sort of. Their units are built in the Mothership high above, and dropped from Space right next to the Flagship. They’re inactive for a brief moment while they power up, and are extremely vulnerable during that time, as their shields are inactive. Harvesting also works differently. 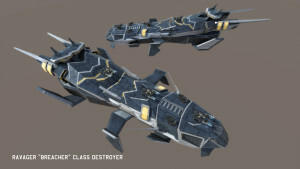 While the Coalition and the Navy both harvest resources with specialized units, the Ravager Flagship also acts as harvester, firing a mining beam into the water, and a transport beam up to the Mothership. This means that Ravager players are likely to fortify themselves around resource deposits. Now that we have the formalities out of the way, let’s get down to business! 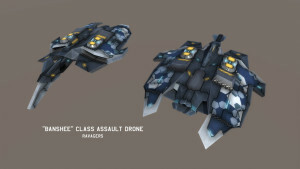 So far, we have three Ravager units: The ‘Reaver’ frigate, the ‘Breacher’ destroyer and the ‘Banshee’ drone. And we’re going to start with the Reaver of course. 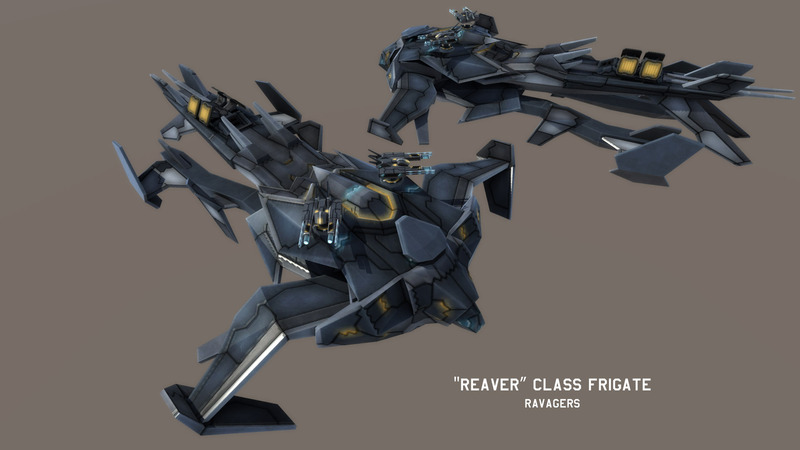 The Reaver is a light, fast attack vessel, and one of the earliest available in the game. It’s armed with two dual liquid metal cannon turrets, and two “Swarmer” missile launchers mounted in its shoulders, each firing 6 missiles. 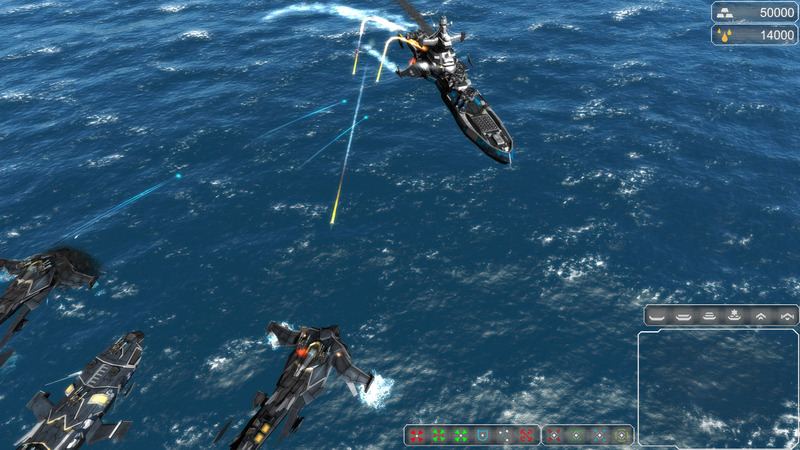 The Reaver can eject its shields, causing a localized EMP burst that disables any units nearby, but leaves it unprotected, meaning that if there are any units outside of the blast zone nearby, the Reaver firing the EMP will likely die very quickly. All in all, it’s built to harass the enemy, with great speed and decent armament and protection. Fast, but otherwise very unlike the Reaver, the Breacher is more of a general combat unit. 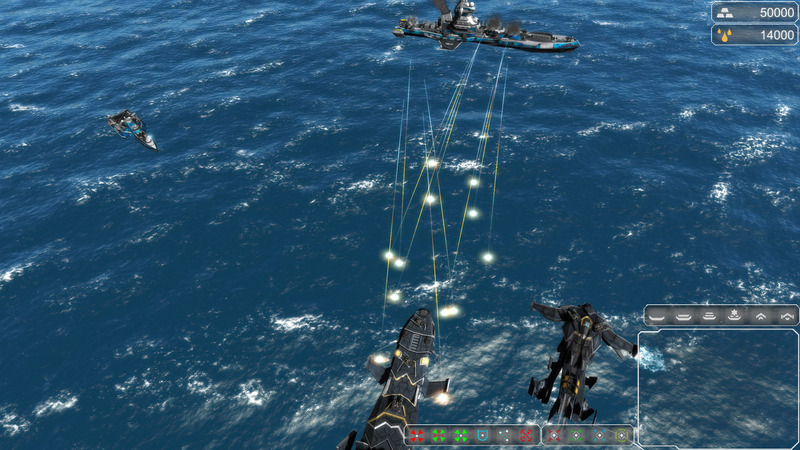 Its armament consists of 3 dual liquid metal beam turrets, and 3 Swarmer launch bays, each firing 8 missiles. In addition to that, it has 4 twin water cutter cannon turrets, two on the top front of the hull, and two under the tail prongs, for close range defensive purposes. It’s faster than any other ship of its size class, though still slower than the smaller Reaver. Its firepower is primarily focused forward. 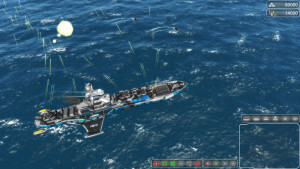 Its shields regenerate faster than those of other ships. It can carry a single combat drone, and comes with a “Banshee” by default. It’s a great general purpose ship, able to deal with many threats on its own, but it will struggle with long range sniping units and heavier units than itself. And now the aforementioned Banshee. The Banshee is a fast fighter-bomber drone, able to deal with most aerial threats quite easily, but it can’t do much against heaver units, particularly large and capital ships. 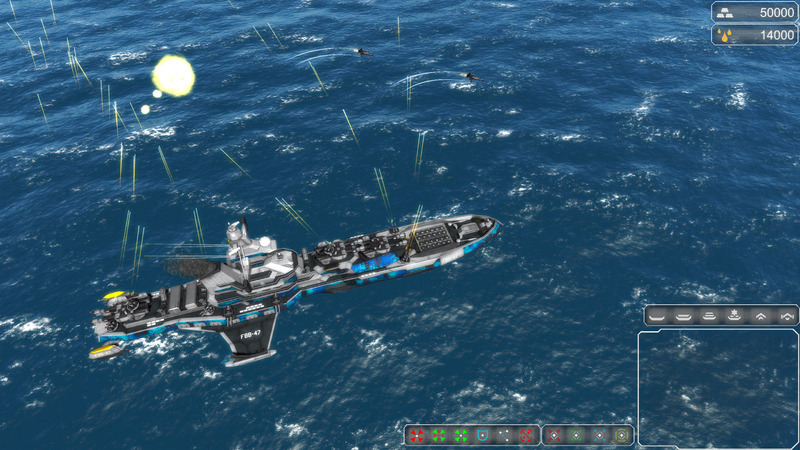 It’s armed with a single 8-shot Swarmer launcher, with another 16 missiles in storage. Like all Ravager units, it has weak armor and powerful shields. Unlike other Ravager units however, it has to rearm and recharge at its carrying ship periodically. Overall, it’s great to take the skies, but not well suited for any other jobs. And now, back down to Earth. Or not? There are news about the TDN too. 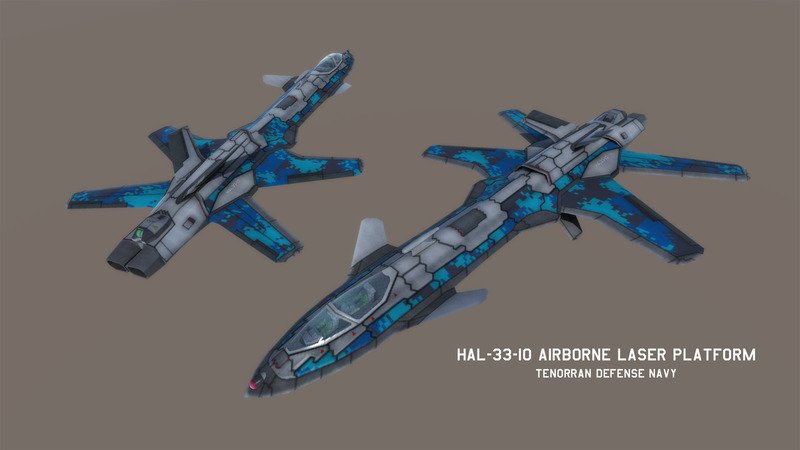 They have a new unit, the HAL-33-10 High Altitude Laser. Basically an aerial area denial weapon. 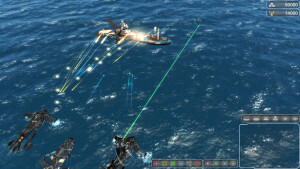 The HAL is armed with two anti-aircraft laser turrets firing Green beams, and two anti-missile lasers, firing Red beams. It’s very much capable of dealing with larger numbers of hostile aircraft, if it stays out of their range. It’s very fast, but isn’t the most well armored aircraft around. It differs from other TDN aircraft, in that it can only be built and deployed from Airfields on Islands. If you need to protect a fleet from enemy air forces, this is the unit you want. You already know these next two units. Nothing too big has changed about them, but I think they deserve a proper introduction, too, and have received some extra artistic love. Future news updates are going to include proper introductions to already existing units, until every one is covered. A fast hit-and-run unit with weak armor, but good firepower. 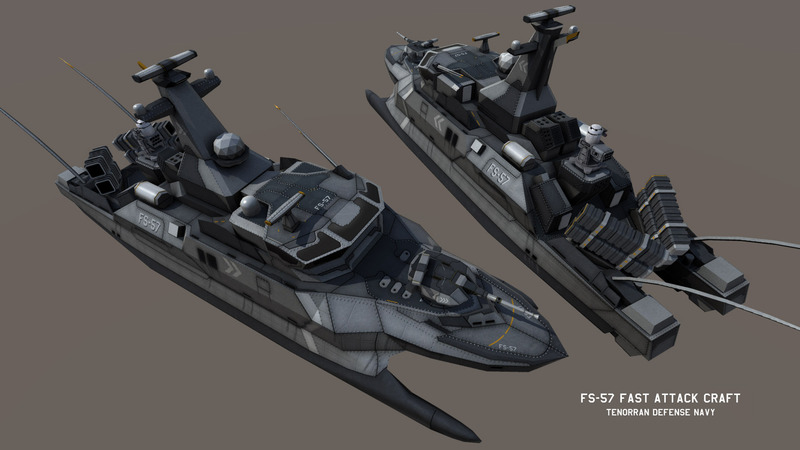 Unlike most TDN units, the Fast Attack Craft doesn’t have very long range. 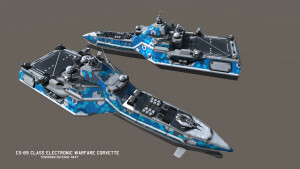 It’s armed with 2 forward facing Light Anti-Ship Missile Launchers, a 40mm Autocannon turret in the front, that can fire at surface and air targets alike, two 30mm point defense cannons, that too can fire at everything but have less range than the 40mm gun, and lastly a SeaRAM CIWS turret. A good early game harasser, and still good at supporting larger ships later in the game. 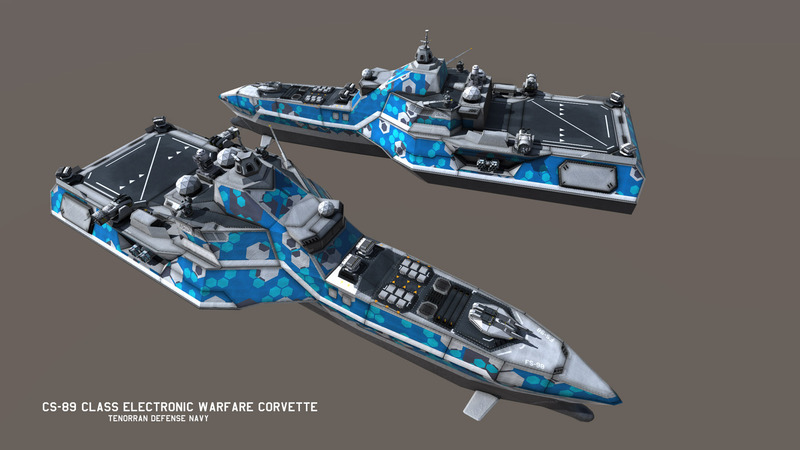 The Corvette is an agile electronic warfare and scout ship, lacking armor, but undetectable on Radar. 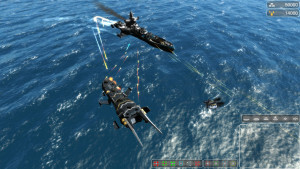 It has a Helipad that can support one helicopter or VTOL. Additionally, it’s designed to combat submarines. It’s one of the most gratuitously armed ships of its size. 12 Anti-Submarine missile tubes, 4 Anti-Submarine grenade launchers, a 75mm burst-firing autocannon turret, a SeaRAM CIWS, 2 30mm Point-Defense Weapons, 2 EMP cannons, and 2 Electric Smoke Grenade launchers, fired through a special ability, that create a lingering EMP effect in the target area. 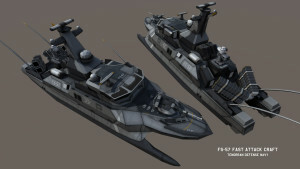 Although it’s a small ship, it’s not available until very late into the game, being a high tier unit. It’s also an area-denial weapon, being able to lock down entire areas with its electric smoke and EMP cannons, while simultaneously deterring any submarine movement nearby. Part of the UI works, and has a set theme now, the TDN have a faction logo, info on the way tech levels/tiers work, a demonstration of the unit customization, and a load of screenshots. 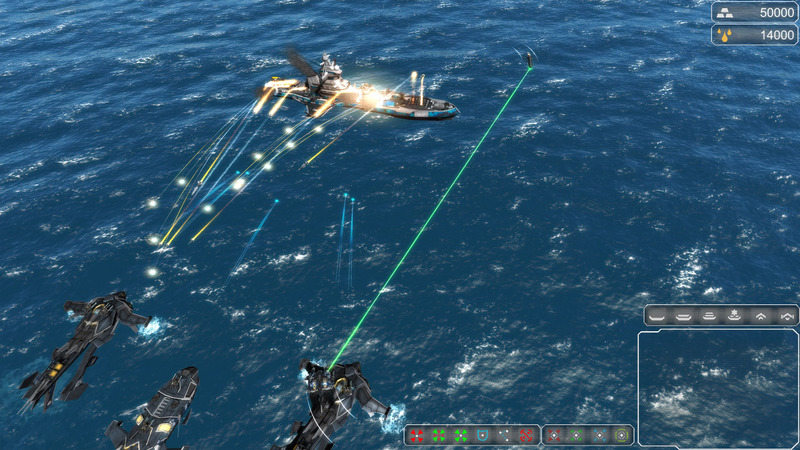 Also, the Battleship has received several Quad AA-Guns. The UI is seen in the screenshots below, and doesn’t really require all that much explanation. Resources are displayed in the upper right corner, abilities and buildable units are in the bottom right corner, with a unit type selector above, and attached to the left of that, we have unit stances, waypoints, etc. The 6 stars represent the 6 nations part of the Tenorran Defense Union: Atlanta, Bretania, Euras, Helena, Latania and Norsia. 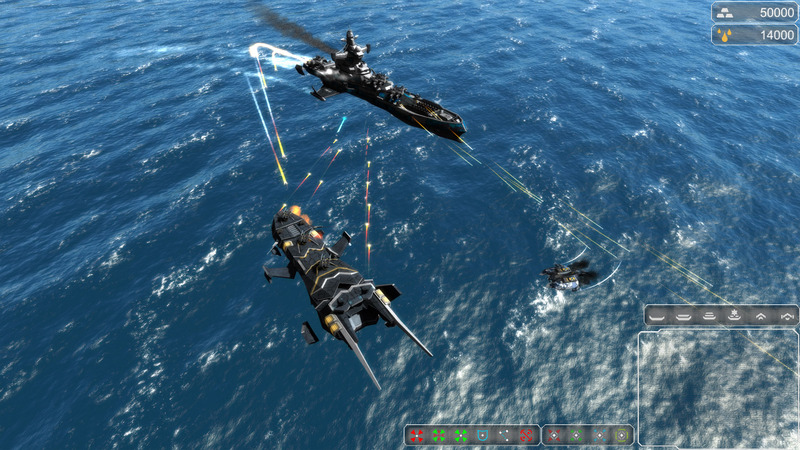 Players start at Tech 1, with a collection of units available to them, and more that can be researched. To advance, Tech upgrades are purchased on the Flagship, each unlocking more units, and making more available to research, up to Tech 4, which unlocks Capital ships, like the Supercarrier.